Loyarburokker JoFan Pang launched the ASASI Internship Programme as a new KPUM flagship event. The first internship programme of its kind, it focuses on human rights and civil liberties. 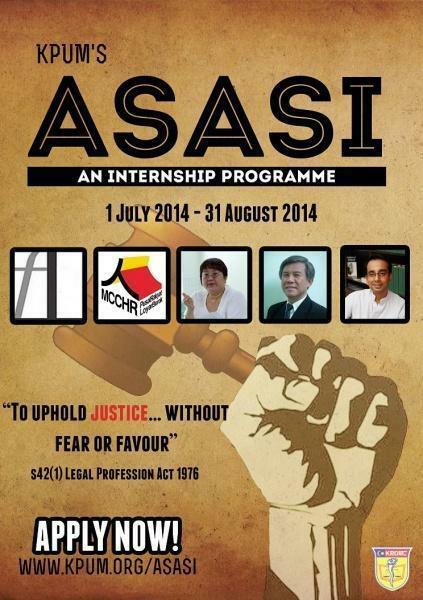 ASASI is an internship programme by KPUM, the Malaysian Law Students Union of the United Kingdom and Eire. A pioneering project under KPUM’s new human rights and activism portfolio, this internship programme focuses on human rights and activism in the legal profession — an area so vital, yet not given the attention that it deserves. One word: Exposure. Law students nowadays would mostly be on the lookout for big name firms, viewing the legal profession solely as a money-making platform. Now this isn’t wrong, but one must remember Section 42(1) of the Legal Profession Act 1976, which clearly states that the role of the Malaysian Bar (and all it’s members, i.e. lawyers) is to “uphold the cause of justice… without fear or favour”. As readers of the law, we are not only given a statutory duty to uphold justice, rule of law and condemn oppression, but we also have a higher moral obligation to actively promote these values in whatever way we can. Through the various internship opportunities and activities that go beyond office hours, ASASI aims to provide such an exposure to every single intern within the span of two months. Although one may not be able to grasp everything during that short period of time, we believe that any exposure is good exposure as we aim to widen the perspectives of these participants to the many possibilities of branching out within the legal profession itself. Hopefully, we would also be able to see ‘graduates’ of this programme searching for more of such internship opportunities to further hone their personal capacities, or to get involved with one of the many movements currently in existence. We also most certainly wish to provide an opportunity for those already eager to pursue this area of legal practice, but who do not know where to begin. That being said, for those already experienced volunteers in civil society initiatives and who have had prior experience, then perhaps this internship programme is not for you. Bear in mind that we should always aspire to train, equip and share with others. Who is eligible for ASASI? ANY Malaysian law student currently studying either in the UK or Malaysia will be eligible for this internship programme. Those studying in the UK would of course have to return to Malaysia this summer to participate in this programme. What can you expect from ASASI? FUN! Lots of it! (We’d like to think so, at least). One should definitely expect the amount of work that comes with any legal internship, only that participants in this programme will also be introduced to cases dealing with the protection of human rights and civil liberties in Malaysia. One should really look forward to working with our amazing partners who are masters within their respective fields — with years of experience and a wealth of learning opportunities to offer. You will see on our Partners page that we have human rights lawyers experienced in women and children’s rights, freedom of religion, death-in-police custody, environmental human rights, cases involving political persecution and much more. One can also look forward to the very interesting weekly sessions (outside office hours) organized for participants — ASASI+. It is a series of side-events happening in conjunction with ASASI Internship Programme featuring informal sessions with prominent Malaysian civil liberties lawyers, fun and engaging gameshops involving real-world human rights problems and a chance to give participants a taste of what it takes to get involved in human rights and public interest related legal work in Malaysia. ASASI+ is compulsory for all selected interns and will also be opened to public (specifically law students) to make sure that the exposure is not merely exclusive to the selected-few. Internship opportunities may be limited, but the movement belongs to all who avails themselves! 4/7/2014 — Richard Wee: Introduction to the Malaysian Bar & the Malaysian Bar’s role in upholding the rule of law in Malaysia. 11/7/2014 — MyConstitution: MyConsti Workshop (Bar Council Constitutional Law Committee). 18/7/2014 — Shanmuga Kanesalingam: Freedom of Religion and the Law. 1/8/2014 — Roger Chan: Environmental Human Rights. 8/8/2014 — Honey Tan: Women, Children and the Law. 22/8/2014 — BONadvocates: Strategic Litigation (#StLit) Gameshop. For all law students who are interested to apply for the programme, hesitate no longer! Application closes on 30 April 2014. Posted on 17 April 2014. You can follow any responses to this entry through the RSS 2.0. Read more articles posted by JoFan Pang. After getting the degree program in the law studies about writing a letter of reference you have to work hard. If you want to get good job in your future then it's your duty to do an internship with gread reference. There is a kpum's asasi internship program for the student of laws. You can learn from them with good piece of work. After getting the degree program is writing a letter of reference in the law studies you have to work hard. If you want to get good job in your future then it's your duty to do an internship with gread reference. There is a kpum's asasi internship program for the student of laws. You can learn from them with good piece of work. How to write a business plan and brand positioning statement that will put investors and customers in a frenzy-it's all revealed in this article. From brand-new entrepreneurs to fast-growing start-ups, every businessperson can benefit from these tips. An internship is a pre-professional work experience for the students and recent graduates by which they gain experience in a particular career field. Hi JoJoBA, Malik Imtiaz is accepting interns for the internship programme, but is not part of the speaker's list for ASASI+, a separate event going on in conjunction with the programme. Why is Malik Imtiaz on the poster but not on the schedule?